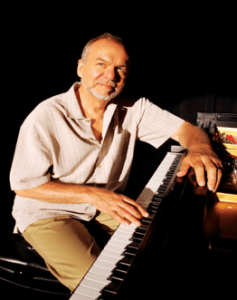 Steve Rudolph has had an inspiring career in his 50 years of professional music making. The winner of the Jazziz Magazine Piano Competition, Rudolph was also awarded two Jazz Composition Fellowships from the PA Council on the Arts. With eleven acclaimed CDs, he has served as producer, arranger and performer on many recordings including CDs with Johnny Coles, Bill Goodwin, Ali Ryerson, and others. He has performed with many jazz masters including Louie Bellson, Clark Terry, and Cal Collins, and has toured the world to places like India, Europe, Russia and the Caribbean. Since moving to Harrisburg in 1978, Rudolph has been largely responsible for the growth and development of the thriving jazz scene in Central PA. He founded the Central PA Friends of Jazz and is currently the Executive Director, and his dedication to the arts and community service won him the 2002 Harrisburg Arts Award.